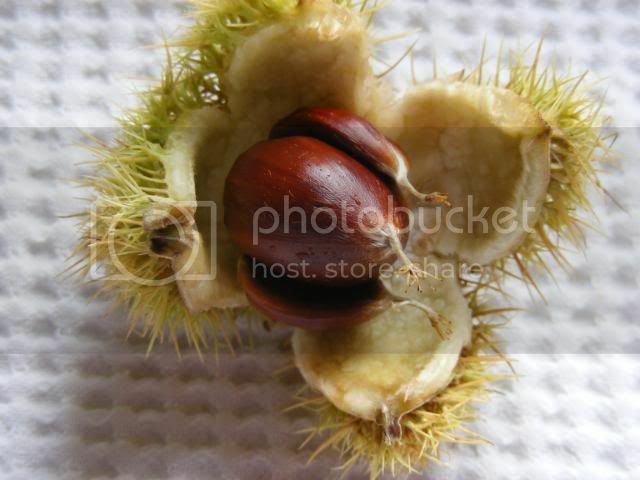 I'm roasting a pheasant tomorrow night and I have some sweet chestnuts (gathered locally, I might add and boast!). A few weeks ago I made some elderberry and crab apple jelly. Now, I'm thinking of combing the roasted chestnuts with the jelly to serve with the pheasant. Anyone tried this and what do you think? I think that sounds excellent - it would make a rich and fruity sauce - perfect for pheasant which can be a bit dry. Oh boy! No pheasants, no elderberries! Wild boar with plum jam or maybe rowan berries would go well? Next year maybe if those pigs keep digging up our plot! That must be so frustrating Joanna, I'm pleased that we don't have too many wild boar in England. Hi, Tim, and welcome. I am really curious about how you found chestnuts. Whereabouts do you live? I have only ever seen horse chestnut tress growing around here. The last time we had street roasted chestnuts was when Fiona won a weekend holiday in Como three years ago, after buying some cheese that had a "win a holiday" sticker on it. I have to say that the Italian chestnuts were superb. The vendors had this great big cylinder, mounted over a barrow of coals, that they could rotate using the handle on the end. It was a fascinating sight, sitting at the other end of the piazza and lazily sipping a beer while watching the world go by. Well it shows how often I get to sit down and log on. It's a fortnight since I roasted the pheasant and yes the chestnut sauce with the jelly went very well. The trouble-and-trife was very impressed. It's been a good year for them and we gathered a good few pounds of them and spent hour after hour evening after evening blanching and peeling the damn things! But it was worth it. We've made sweet chestnut soup, sweet chestnut and apricot stuffing, roasted sweet chestnut, boiled sweet chestnut, they're in the freezer, the fridge and every corner of every cupboard in the kitchen. My hands have been brown for the past two weeks. I like them though and we've been back a couple of times to pick up some more though that's enough for this year. Don't know if you've come across this web site www.gametoeat.co.uk . Found it on the calendar in my mum's kitchen. The recipe on the calendar for November was roast pheasant with chestnuts and madeira and this site was mentioned...can't find that recipe on the site but loads of others if you like game. I shall try a couple as I've been given 6 partridge and two pheasant this week. I've been given 6 partridge and two pheasant this week. Just like that? You lucky girl! I'd be interested to know how you make use of your bounty. Tim, I have no idea of the soil composition in these parts, but alluvial wotsit seems about right. I will have to ask 'er wot gets her paws muddy. Buckinghamshire clay here, good for roses and rheumatism. I am happy to say that so far I only have the roses. And Scioliosis, so you can't blame the soil for that can you? my bounty was a bonus given to my son's who went beating for a shoot they got paid too, so all happy. I'll be trying the partridge this weekend will report back later on what I try. That is a decent bonus, extownie. Before John Coe retired from helping us with our garden, he would regularly act as a beater on shoots and arrive at our house with a brace of game birds. I think that partridge is nicer than pheasant. Hopefully we will be given some this year. Fiona does a neat trade: give me your birds and I will pluck and dress them in exchange for half the bounty. It works well. I haven't mastered plucking and gutting. I take them to a local farmer who does them for me at a reasonable cost £8 for 6 birds. Maybe one day i'll do it myself - someone told me to skin them rather than trying to pluck them but i think the skin helps keep them moist?